Faden Quartz crystals from Pakistan have been around for a while but are almost never seen associated with other minerals. I acquired a couple dozen of these colorful specimens at the 2008 Springfield Mineral show. I was a little skeptical about the blue mineral present on the specimens, having been told that it was Smectite. A quick visit to Alfredo Petrov's booth resulted in him stating that it could be Smectite, although neither one of us had seen such vividly colored examples of this mineral. After testing the specimen to ensure that the specimen had not been dyed, I then sent a sample to John Attard for XRD analysis. He confirmed that it was indeed Smectite. This specimen represents one of the best Faden Quartz mineral associations from Pakistan. 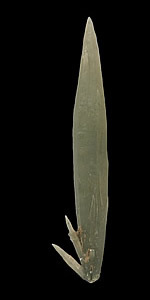 This crystal in addition to exhibiting the "faden" habit, is also a little bit curved in form. This specimen features many double-terminated and clear Quartz crystals showing faint Amethyst phantoms. This cluster of Quartz is almost a floater with just a small area of contact on its bottom, just below the fattest crystal. This specimen is a great example of Amethyst from what many consider to be Australia's premier Quartz locality. 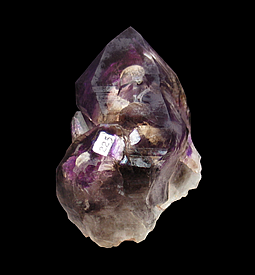 This crystal has a rich, deep-purple hue with broad flashes of red. There are also areas of smoky color and there are some inclusions of clay (as shown in the far-left photo) as well, making for a pleasing contrast of colors. The lustre of this Amethyst is very glassy, almost mirror-like. The crystal is doubly terminated with no damage save for a sub-millimeter-sized area of wear on its termination. A classic Quartz from the pegmatites of northern San Diego County. In 1970's several pockets with Quartz crystals with pink & tan Montmorillonite inclusions were found at the White Queen Mine. Many of these crystals, especially the larger ones, were sawn in half & polished to better show these inclusions. What saved this one from being brutalized by saw and lap is the fact that a portion of this crystal had dissolved and re-crystallized leaving a cavernous indentation. The faces of this crystal that haven't been etched are glassy which is uncommon for this material. Examples of these crystals are rarely seen these days. The Messina mine is famous for the included Quartz specimens it has produced. 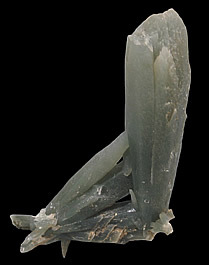 The Ajoite or Papagoite included Quartz crystals from this location are often covered with a crust of Epidote, Hematite & other minerals, obscuring the copper mineral(s) included inside. Unpolished examples of included Quartz from Messina, such as this one, are almost unheard of. This crystal is complete with just a small area of contact on its rear. 5.8 x 3.5 x 2.8 cm. Naturally occurring Smoky Quartz from Arkansas is extremely rare. This glassy and transparent crystal is a complete, all-around floater and is pristine. The contacted, flat base is damage-free. As a bonus this crystal also has a fluid inclusion with a gas bubble as indicated by the arrow marked on the side. This Quartz crystal was collected in 1939-40 by Glenn H. Hodson who, years later, became a mineral dealer in Scottsdale, Arizona. Double-terminated Smoky Quartz crystals of this quality from the Ouachita Mountains, not Hot Springs, are rarely available. Here we have an example of iron-included Quartz, known in German as “Eisenkiesel”. The Quartz crystals sit on a matrix of coarsely-crystalized Fluorite, variety “Stink-Fluss”. 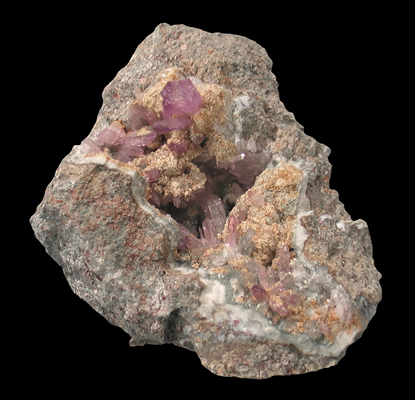 Stink-Fluss is a variety of Fluorite, especially from Wölsendorf, Germany, that emits an odor and ozone upon grinding due to the internal presence of free fluorine and calcium and the interaction of those components with water upon grinding. Despite its name it won't stink up your mineral cabinet. An unusual pair of mineral oddities. Several of the quartz points show a little wear but does not detract from the specimen's appearance. This superb specimen of dark, smoky-purple crystals of Amethyst hails from the world famous Thunder Bay District of Ontario, Canada. 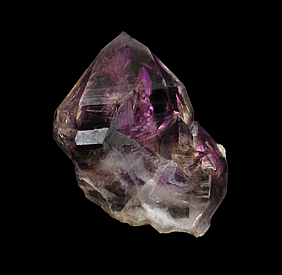 Amethyst specimens such as this one have been held in high regard by collectors for many, many years and rightly so. This specimen is complete all around and can be displayed in many different orientations. Collecting at Thunder Bay is extremely difficult, but the beauty of these specimens makes it all the more worthwhile. A Quartz crystal that is heavily coated by crystals of Clinozoisite in groups and as singles. The Quartz is clear and is doubly-terminated, albeit crudely. 8.6 x 2.5 x 2.1 cm. This is a Quartz crystal that, inside the rock where it was formed, was submitted to a high electrical voltage created by lightning hitting the rock (not the Quartz crystal). Due to its piezoelectrical properties, the Quartz crystal submitted to this high voltage will expand or contract (depending on the signal of the electrical field, positive or negative). The result is a weird crack pattern that develops on the crystals faces of the Quartz. There is a paper about these type of crystals that was published by Prof. Joachim Karfunkel et. al., from University of Minas Gerais, who found the explanation for these weird crack patterns. 7.5 x 4.1 x 3.5 cm. Here we have a complete all-around Amethyst cast after Calcite. 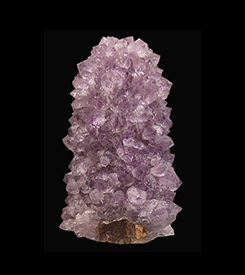 This specimen consists of a tower of numerous medium-purple Amethyst crystals. If you look up the bottom of the specimen you will see the sharp, pseudohexagonal form of the dissolved Calcite crystal. The Calcite was completely etched away by corrosive solutions in the pocket, leaving the Amethyst. These specimens are one of nature's better looking mineral oddities. An unusually-shaped, translucent, colorless Quartz crystal known as “interference”Quartz from the famous Bor Pit at Dalnegorsk, Russia. These crystals are unique to the Bor Quarry. The Quartz crystal growth was interrupted by Calcite, as evidenced by stacked, poker chip-looking section in the middle of the crystal. This unique piece is complete all-around, with only slight contacting on the bottom termination. 6.6 x 2 x 1.7 cm. The pseudomorph specimens from this location have always been one of my favorites. They consist of an Epidote crystal that has been entirely replaced with Hematite faithfully retaining its original form. A later generation of Quartz crystals then grew on the faces of the pseudomorph. You almost never see these Quartz covered pseudomorphs offered for sale anymore. 7.1 x 4.5 x 4 cm. 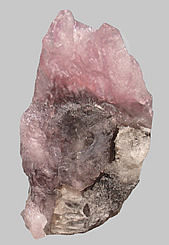 This specimen features Rose Quartz of good color capping a well-formed, prismatic crystal of Quartz. In the middle of one of the terminal faces a brown-colored inclusion can be seen; perhaps one of the phosphate minerals found there. Rose quartz is very rare in good crystals, and is the most prized of the Quartz varietals. 6.2 x 4.5 x 2 cm. After Laurium, the small island of Serifos (where iron has been mined since Roman times) is probably the most renowned mineral locality in Greece, especially for these world-class specimens of Quartz heavily included by the mineral Actinolite. These crystals are thought to have grown in irregular cavities encompassing the fibrous Actinolite which had formed earlier. 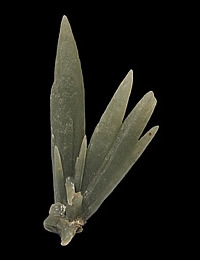 These included Quartz specimens were first brought to market in quantity at the 1988 Tucson Mineral Show, being sold as Hedenbergite included Quartz. Since then, only occasional small lots have trickled out into the mineral market afterwards. Demand for these have always been highly sought after due to their rich color. Specimens of these amazing crystals are hard to come by these days. 7.2 x 1.5 x .9 cm. 6.6 x 4.1 x 3.5 cm. Here we have a Chlorite-included Quartz from Brazil that is better than most. 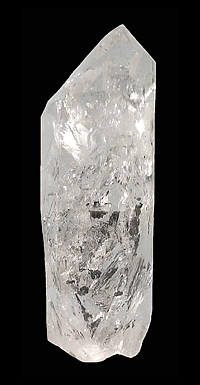 This specimen consists of a very gemmy 6.6 centimeter crystal of Quartz that is included with phantoms of green and silvery-white Chlorite. 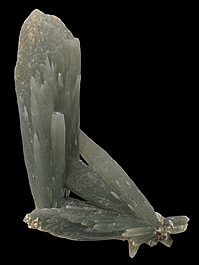 On the rear of the main Quartz is an explosion of smaller Quartz crystals, some of which are included with Chlorite. This specimen is that it is not chipped (as so many seem to be) nor has it been polished to better view the inclusions. 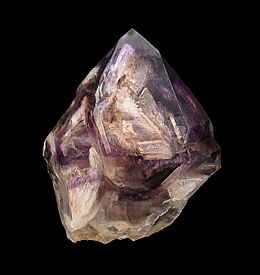 As sculptural Amethyst "flower" from Iraí. Although light in coloration, the glassy crystals on this specimen are clear to translucent. This specimen is nearly a floater with only a few small dots of green indicating points of contact on its back. The Getchell mine is famous for its stunning specimens of Realgar and Galkhaite. Top notch Quartz crystals with good form can be found there too but are seldom seen as they are almost always covered in a cement-like layer of clay that is extemely difficult to remove. This specimen came from a haul of crystals recovered by the late Southern California digger, Ken Gochenouer. 7.6 x 3.9 x 3.5 cm. 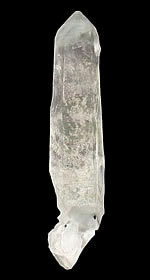 Here we have a gemmy crystal of Quartz from the well-known specimen producing area of King County, Washington. This area is known for its beautiful Pyrite and Quartz specimens. This is a complete crystal with no damage. This locality is notorious for the difficult conditions that must be endured while collecting. 5.3 x 4.9 x 3.1 cm. A stout Dauphiné-twinned, 5.3 centimeter Smoky Quartz partially penetrated by a nearly 5 centimeter Smoky Quartz. 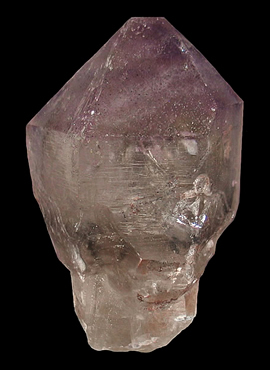 This crystal has many unique growth lines and patterns on some of the crystal faces. These Smokies from Lolo Pass don't seem to be as abundant as they used to be. Collected in the 1980's by Jim & Dawn Minette. 7.2 x 2.3 x 3 cm. 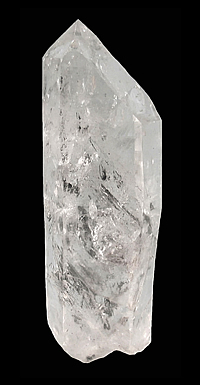 A well-formed and clear scepter-type example of Quartz. This crystal is complete all around with a bifurcated termination. This area is best known for the beautiful Pyrite and Quartz specimens that are found there. This locality is notorious for the difficult conditions that must be endured while collecting. 5.8 x 2.9 x 1.9 cm. 6.8 x 2.5 x 1.8 cm. Here we have a clear Smoky Quartz crystal that has a peculiar overgrowth of milky Quartz. 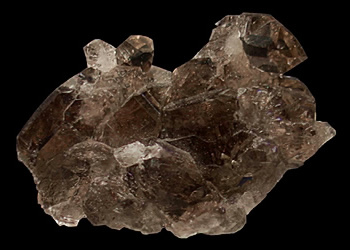 The brown patch (including some growth hillocks, indicating regrowth) at the rear of the crystal is where it abutted another Quartz crystal during its growth, and it allows us a fine view into the smoky interior. A curious Quartz crystal from a now classic mineral locality. 9 x 2.8 x 3 cm. This unusual included Quartz has three faces that are extremely clear and glassy and three that have a more coarse and sandy texture. The glassy surface exhibits a very interesting, tessellating growth pattern. As well as possessing an unusual termination, this specimen has patches of a very soft, blebby dark mineral. When viewed from the bottom, the sectional structure that runs up the length of the crystal is revealed. This specimen is far better in person than in the photos. 8.2 x 2.5 x 1.8 cm. This Quartz crystal is very gemmy and has many sprays of a gray-blue fibrous mineral, that according to Luiz Menezes has been analyzed and found to be Dravite, included within its termination. An unusual included-Quartz specimen in my opinion. 10 x 6.2 x 4.7 cm. This specimen of scepter Quartz is from a location that produces some very interesting crystals. 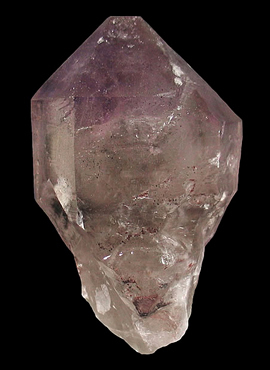 This crystal has a termination of Amethyst a middle zone that is nearly clear and colorless with a ring of slightly Smoky Quartz at the base of the head of the scepter. 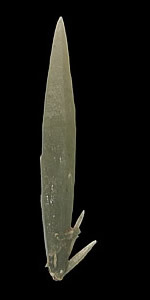 The stem of the scepter is translucent and colorless. The termination of this specimen has many interesting-looking growth hillocks. A fine example of scepter Quartz from a country that has a seemingly endless and diverse supply of minerals. 9.5 x 6.5 x 3.9 cm. A vuggy specimen of gemmy Amethyst crystals from a classic locality. These gemmy Amethyst specimens from Sardinia were at one time abundant but it has been a while since I've seen any really good examples of this material for sale. The label accompanying this specimen indicates that it was obtained in May of 1973. 6 x 3.1 x 2.5 cm. 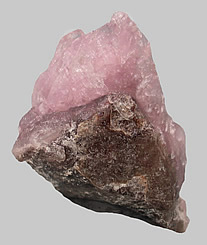 Rose Quartz, while common, is rarely found as crystals, most of which are found in Brazil. This rare specimen is from the small find made in 2002. No more of these spectacular Rose Quartz crystals from Afghanistan have been found since. Most of the Rose Quartz crystals from this find could be measured in millimeters. 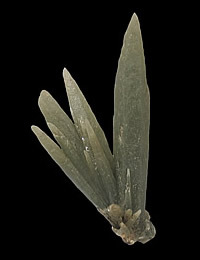 This specimen features single crystals up to 1.9 cm. in size, making an already rare specimen even more exceptional. 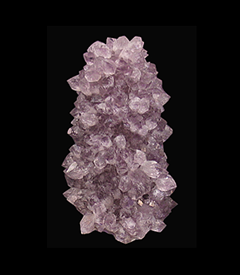 Unlike most crystallized Rose Quartz, the Afghani specimens tend to have a lavender-rose hue which in contrast with the Smoky Quartz makes for a very aesthetic specimen. 4.5 x 2.5 x 2 cm. Here we have a lightly-hued Smoky Quartz with good clarity from a location that is famous for the quality of the Quartz crystals that have been found there. It is very hard and dangerous work collecting crystals in the mineralized clefts of the Swiss Alps. Good examples of Swiss Quartz are hard to come by in the U.S. as they are highly prized by the Strahlers that collect them and are much sought after by European collectors. 4.5 x 2.5 x 2.3 cm. Here we have a clear crystal of Smoky Quartz with a slight dusting of Chlorite from a location that is famous for the quality of the Quartz crystals that have been found there. This Smoky Quartz has a depression on its rear face with very interesting growth patterns. It is very hard and dangerous work collecting crystals in the mineralized clefts of the Swiss Alps. Good examples of Swiss Quartz are hard to come by in the U.S. as they are highly prized by the Strahlers that collect them and are much sought after by European collectors. 10.3 x 3.6 x 2.5 cm. Here we have a large, incredibly gemmy Quartz crystal with numerous inclusions of Graphite measuring up to 2 cm. in size. It is incredibly difficult to convey in a photograph just how glassy these crystals really are. As far as I am concerned, these are the most interesting Quartz crystals that I have seen come from China. Graphite inclusions in Quartz are very rare, and even more so, in a Quartz crystal that is so glassy and lustrous. 6.5 x 4.6 x 3 cm. Despite the way it looks in the photo, this cluster of fine Smoky Quartz crystals is water-clear. This specimen was a pain to photograph, even the guy I got it from had problems photographing it for his website. This Smoky Quartz looks so much better in person. This beautiful Quartz specimen is essentially a floater, with only a small area of contact on its bottom. The bottom of this specimen features multiple terminations and several smaller Quartz crystals. A fine example of Alpine Quartz for which this location is justifiably famous for.